Like Garbo, our Greta chair is a Hollywood legend. 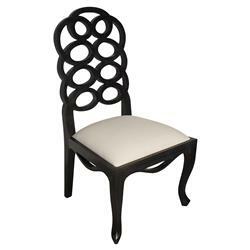 An understudy for the Francis Elkins loop chair from 1930’s Hollywood, this replica has a modern vibe with classical allure. Sold in pairs, it can take the lead role as a desk chair or be part of an ensemble cast at the dining room table – and it will always be the most glamorous part of any room.